During most of their mandate in Israel, the British restricted Jewish immigration. Right after the Holocaust, during which more cart one-third of the Jewish population was destroyed, the British did not allow free Jewish immigration. Jews did not accept this situation, and attempted to reach Israel "illegally," despite the British blockade. This "illegal" aliya known as the ha'apala (the Biblical Hebrew word means "to go up in force"). From 1934 until the State officially came into existence on lay 15, 1948, more than 130,000 Jews tried ) reach Israel without valid British immigration permits. With the exception of the years of World War Two, when Jews were unable to leave Europe, the number of Jews interested in aliya always exceeded the quota of immigration permits. While the overwhelming majority (more than 07,000) of ma'apilim came to Israel by way of the Mediterranean Sea, Jews tried to reach Israel in any way possible. Clandestine flights brought at least 150 Jews into Israel "illegally;" 500 Jews entered on forged passports; 6500 rived on valid tourist visas, with no intention f leaving Israel, or through fictitious marriages to residents of Israel, and 5500 entered Israel "illegally" overland. The majority of ma'apilim were European Jews, though a signficant number of Jews from Arab countries [so made their way to Israel "illegally." Following the Second World War, the vast majority of ma'apilim were survivors of concentration camps. 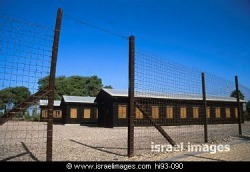 As the numbers of ma'apilim increased, the British opened detention camps for those who sere caught. The largest of the detention camps was Atlit; less than twenty kilometers south of Haifa. The site was chosen because it on the Mediterranean and close to the main British naval base at Haifa, since the sea was was major route of the ha'apala. Over the past few years, the Atlit detention camp has been rebuilt and is being developed as a museum of the ha'apala.